Shana Cleveland, second from right, channels the vastness of Los Angeles on La Luz's upcoming third record. A lot has happened since La Luz released their most recent full-length album, 2015's Weirdo Shrine. They pulled up their roots in Seattle and set them down again in Los Angeles, and finished recording their third album at the end of last year. That record's release date, title and track listing have yet to be announced, but it should be out sometime this year, and it explores what La Luz songwriter and guitarist Shana Cleveland describes as themes of "love and lust and extreme darkness." INLANDER: What necessitated the move from Seattle to L.A.? CLEVELAND: We all met in Seattle, and we had all been there for a really long time. I think [keyboardist Alice Sandahl] and I had been there for 10 years; [drummer Marian Li Pino] more or less grew up there. So I think we were all just ready for a change of pace, and California seemed like the natural move to me. And I was kind of tired of the weather of the Northwest. How would you say the respective music scenes of the two cities compare? It's just bigger here; that's the main thing. And that really appeals to me. I was starting to feel a bit claustrophobic [in Seattle]. L.A. is so massive, it can be whatever you want it to be, musically and in every other way. That kind of openness, those endless possibilities; you never know what you're going to get when you go a show here. What has the band been up to since the last album? We're very off-cycle right now. We're just trying to stay sane, I guess. You start to feel crazy if you don't do your job for too long. And we haven't played Spokane in what feels like forever. After we did the bulk of the touring for Weirdo Shrine, we started working on new songs. In November we recorded it, and we finished all the mastering in December. It's just taking forever to come out. 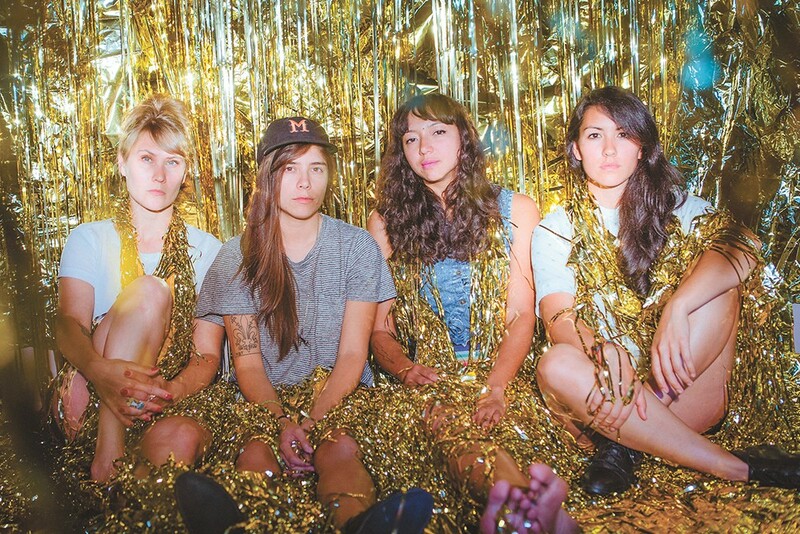 You've established a distinct style on your last few records, so what will a third La Luz album sound like? The main parts of our sound haven't changed. It's still sick with harmonies, and everybody's taking solos now and then. Overall, it feels a little more lush. On the last album, we were trying to capture what we sounded like live. We wanted to make an album that had the energy of a live performance. With this one, we concentrated on overdubs and fleshing it out, exploring the possibilities of what a record can be. Your surf rock and '60s pop influences come through loud and clear on those earlier recordings, but are there artists you admire that people might be surprised to know about? I don't want to put words in anyone's mouth, but I know Marian and Alice are into Dusty Springfield. I've been mostly listening to a lot of rock and roll from Asia and Latin America. I don't know if that's because it feels more mysterious because I can't understand what they're saying all the time, but the guitar tones and the unexpected take on American rock and roll is something that's always appealed to me. There's this one band called Yanti Bersaudara, an Indonesian girl group from the '60s, that has the most beautiful harmonies and killer guitar tone. What specifically influenced this next batch of songs? I feel like I say this for every album, but it was a bunch of Mississippi Records compilations. They make the best tapes. For anybody that doesn't know, they're a Portland-based record store and label, and I think they're the best thing going on in music. They have a knack for picking the most inspiring tracks that I've never heard before. I always go back to those. It's really about the sound of vocals from that era, from the early '60s, the doo-wop bands and garage rock bands. Everyone was so great at vocal harmonies then. Are there any themes connecting the songs on the upcoming album? It feels like an L.A. record to me, in sort of a weird way. It's very much a new-to-L.A. record. It's just discovering a place that feels full of mystery and potential, and a bulk of the songs are based on dreams I had last year. Your music, as you've said, has some dark undertones, but I've heard your live shows are super upbeat and high-energy. Is that accurate?